I got a ics file for an event I signed up for via email. 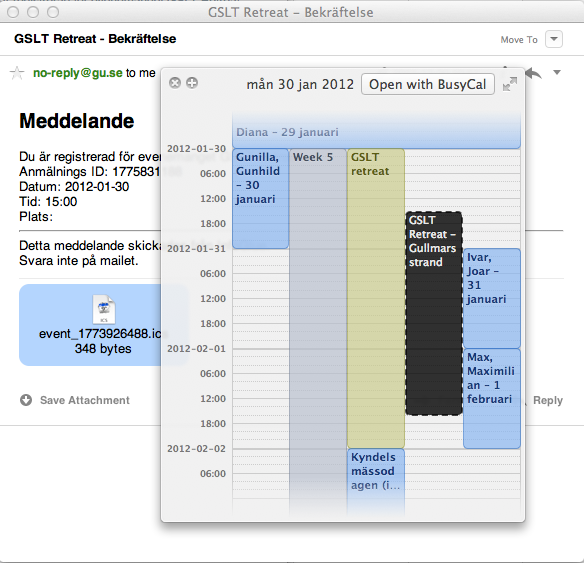 I opened the email via Sparrow and Quicklooked the ics-event file and got a view of my current events in my calendar together with a preview of how the new event would fit in. Timeline “dark launched” in July. This means that for the last five months, every time someone clicked on their profile, Facebook not only accessed its existing databases, it opened the Timeline databases for writes as well. In essence, Timeline was running under the covers, so the team could monitor loads, update code, check for bugs, and, yes, start storing the data. Smidigt sätt att testa funktionalitet och systembelastning! Lol. More error codes where that one came from. Games are darker today. Better looking though. I was linked to this post: http://spelling.wordpress.com/2007/09/05/english-pronunciation/ Which I am quoting in full below. Before the quoted post, I am also attaching two three recorded readings of the poem by Mac OS X Lion voices. One is read by the Serena from the United Kingdom voice, one is read by the Thomas from France voice, and one is read by Alex from the United States.